Marine technology provider Wärtsilä will enable a new Wasaline RoPax ferry to be among the world’s most efficient low-emission ships. 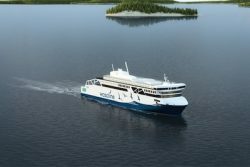 The combination of Wärtsilä 31DF engines, hybrid propulsion, and LNG and BioLNG fuel will establish this ferry as a benchmark in efficiency and sustainability. Wärtsilä will supply an integrated package of products, systems, and solutions. Among the ship’s outstanding features will be its hybrid propulsion solution which will incorporate four highly efficient Wärtsilä 31DF dual-fuel engines capable of operating on liquefied natural gas (LNG) and biogas. The diesel version of the Wärtsilä 31 has been recognised by Guinness World Records as being the world’s most efficient 4-stroke diesel engine. Wärtsilä will also supply the LNG storage, supply and control systems, as well as the thrusters, catalysators, controls, and the integrated electrical and automation systems. The latter will incorporate an energy and power management system to optimise the use and operation of the hybrid power solution. Using Wärtsilä technology and natural gas the CO2 emissions will be reduced by more than 50 percent compared to Wasaline’s current ferry serving this route. “This ferry project represents the perfect alignment of a lifecycle Wärtsilä solution with the lowest possible environmental impact. Furthermore, it is a strong endorsement of Wärtsilä’s Smart Marine approach whereby connectivity and digitalisation are utilised to create greater efficiency, lower operating costs, and better environmental performance. Co-creation with partners and customers is another main element in creating a better industry ecosystem, and we have worked closely with NLC Ferry for more than five years in the development of this state-of-the-art vessel,” says Henrik Wilhelms, Segment Sales Director, Wärtsilä Marine. “We are extremely excited about our new ferry. It will be truly world-class with the latest and most advanced technologies, and for this we appreciate the support that Wärtsilä has provided,” says Peter Ståhlberg CEO at Wasaline.